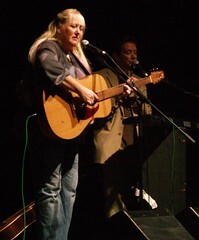 Cover versions of Sandy Denny songs, played and sung by Vikki Clayton, accompanied by Ric Sanders (violin) and Fred “Thelonius” Baker (guitars). ≡ On the face of it, this is either an act of heroism or foolheartiness — a tribute to a figure so iconic and universally lionized that following in her footsteps would seem to invite the sort derision that only the truest true believers can heap upon one another. 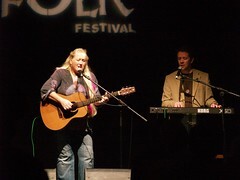 But Vikki Clayton, who has filled in the “Sandy Denny role” at many a Fairport Convention concert, is quite up to the task. She opens this album with Denny’s signature tune, “Who Knows Where The Time Goes,” in sort of a throwdown to any potential detractors, and as on several other songs, her rich, confident vocals and understated arrangements carry the day. There are a few iffy touches, mainly in the electric filters and effects added to the bass and guitar, but overall this is a pretty strong record. Clayton herself is quite lovely to listen to. 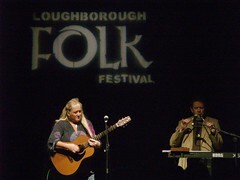 ≡ Loughborough Folk Festival - Oct 06 - thanks to Pete Burnham for the photos. ≡ This is a list of books and articles about or starring Sandy Denny. commissioned by Faber & Faber, due for publication late 2013 / early 2014. This article is now available online at http://www.rocksbackpages.com/. Readers need to subscribe to the site to have access, but it's a very good site, a giant archive of music journalism since it all began - well worth a look. This book has a chapter on Sandy Denny.